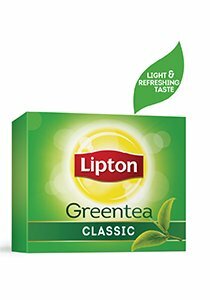 Lipton Pure Green Tea has a delightfully light and smooth great taste with a refreshing aroma. Packed with young tea leaves, Lipton Pure Green Tea is a great way to brighten your day. Our 20 tea bags are packaged in envelopes so you get the same crisp taste and aroma - from the first tea bag and the last. Uplifting when enjoyed hot or refreshing when enjoyed as an iced tea. Ambient (Store in a cool and dry place away from direct sunlight and moisture), 25°C.